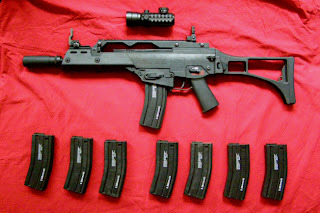 It stayed stock for about 6 months and it actually served me well in both woodland and CQB games with the 315 fps (chrono’ed with .20 gr BBs). 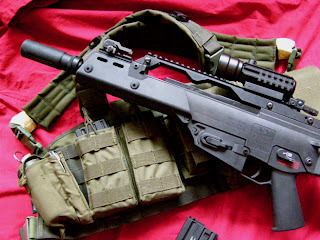 Since I got my hands on a MP5A5 (also made by Classic Army) for CQB games only, it was about time to upgrade the 36…After a lot of searching, installing, un-installing I proudly present to you the WD36sc “Turul”. Let’s start with the name. The first part “WD” is homage to our team’s gunsmith who performed the upgrade and goes with the codename WD. 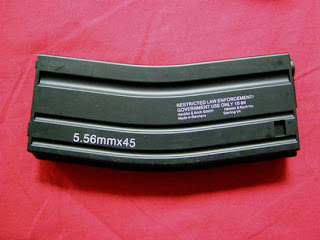 The middle part is the code of the rifle obviously and the last part “sc” stands for “silenced compact” to describe the use of a silencer and the compact size of the rifle. The “Turul” part is my personal tribute and a sign of admiration to the Great Hungarian nation that has embraced me in the best of manners. Now, some words about the Turul. The Turul is a giant mythical falcon, a messenger of god in the Hungarian mythology, who sits on top of the tree of life along with the other spirits of unborn children in the form of birds. According to the legend of origin of the Αrpad clan, it was the divine intervention of God, through his messenger the Turul, which founded the royal family. The following is a recounting of the legend by the chronicler "Anonymous", the royal scribe of King Bela III (1172-1196). In the year of our lord 819, Agyek, the descendant of King Magog and a royal leader of the land of Scythia, married the daughter of Ened-Belia, whose name was Emeshe. From her was born their first son Αlmos. The boy obtained his name because of the unusual circumstances of his birth, when his mother in a vision saw the great Turul descend from heaven on her and made her fertile. A great spring welled forth from her womb and began flowing westward. It grew and grew until it became a torrent which swept over the snow covered mountains into the beautiful lowlands on the other side. There the waters stopped and from the water grew a wondrous tree with golden branches. She imagined famed kings were to be born from her descendants, who shall rule not here in their present lands but over that distant land in her dreams, surrounded with tall mountains. 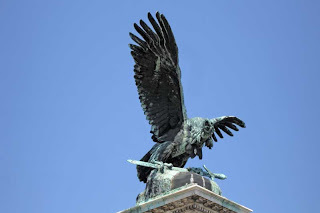 The second time, the leader of the Hungarian tribes had a dream where eagles attacked their horses and a Turul came and saved them, to symbolise that they have to move, and when they did, the Turul helped them to show the way and led them finally to the land that became Hungary. The great mythical Turul bird of prey is one of the most important symbols of the Hungarians. It represents their god's power and will. The Hungarian Turul is often represented carrying the flaming Sword of God. Now with the actual upgrade. I wanted something that will stand out both internally and externally. The gear box remained the original since it can take 120 or more spring upgrades. 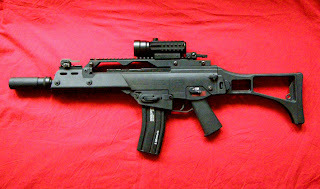 The spring was replaced by a Systema M120. That gives the AEG an initial velocity of around 410 fps which I believe should be around the limit for woodland games…At first there was a HurricanE SP120 spring installed that pushed the beast up to 440 fps but that is passed the fps limits for Hungary and it would create more problems in the future (need of a 9,6V large battery, upgraded gears and so on…). 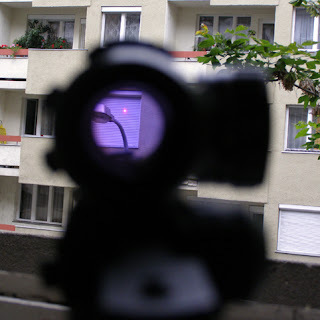 For the aiming of my project an Action 2x42 mm Red/Green Dot Scope is used. 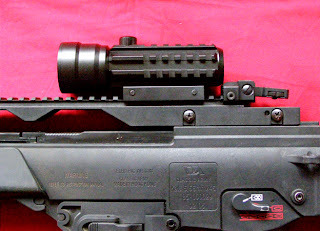 I strongly believe that anything with a higher than 2x magnification is an exaggeration for Airsoft use unless it’s a 500 fps bolt action Sniper Rifle…The only con of this scope is that the objective lens is actually 42mm but the image that comes to your field of view is only 25mm but it gets the job done nevertheless. 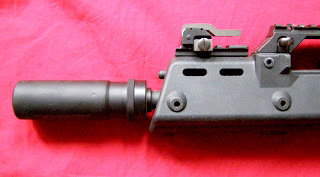 The front sling hook was removed to lighten the fore end of the rifle. Then a First Factory sling hook pin was installed. This gives the advantage of being able to have the gun resting on a more upright position when not in use and being hanged from a 3-point sling. 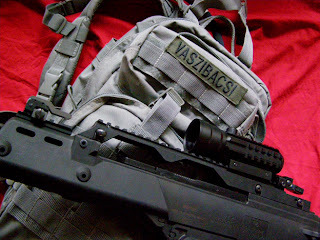 * this text is about airsoft replica which is battery operated. 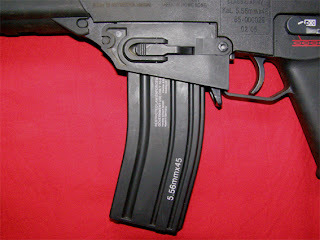 it can not fire live rounds and can not be modified in any way to do so. Αναρτήθηκε από Vaszi bacsi στις 2:05 μ.μ. 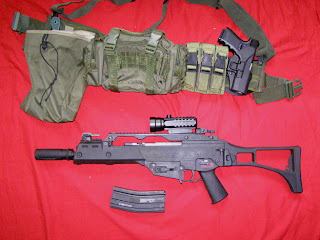 All the "guns" presented here are airsoft replicas which can no way be modified to fire real ammunition. They use pressurized air to propell 6mm plastic BBs that can cause no injuries and are completely legal to own by any adult. Τα μοντέλα τα οποία παρουσιάζονται σε αυτό το blog δεν είναι πραγματικά πυροβόλα όπλα. 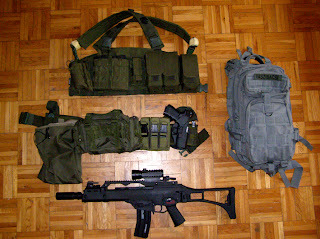 Πρόκειται για αεροβόλα παιχνίδια airsoft τα οποία δεν δύναται να μετατραπούν στο να πυροδοτήσουν πραγματικά πυρομαχικά. Χρησιμοποιούν πεπιεσμένο αέρα για να προωθήσουν πλαστικά μπιλάκια των 6μμ τα οποία δεν προκαλούν τραυματισμούς και είναι νόμιμη η κατοχή τους από οποιονδήποτε ενήλικα.